On the Intercultural Dialogue Day (in 2018 on the 27 September) local AFS volunteers organise public events to promote intercultural dialogue through youth exchanges, volunteering, and active citizenship. AFS volunteers at local level are encouraged to take bottom-up initiative and organise events of various scale to reach externals in communities around them. Do you want to organise and event for Intercultural Dialogue Day and help promote intercultural dialogue through youth exchanges, volunteering, and active citizenship. Check out the Volunteer Guidelines here and don’t hesitate to get in touch if you have any questions. Need ideas for your IDD event? In 2014 the European Youth Foundation of the Council of Europe supported EFIl in creating guidelines and materials for IDD. Check out this video that was one of the outcomes of the project. Every year EFIL invites volunteers to take part in the IDD Photo and Video contest. Click the “how to enter” button and read all about the competition including how to enter and what you can win!. 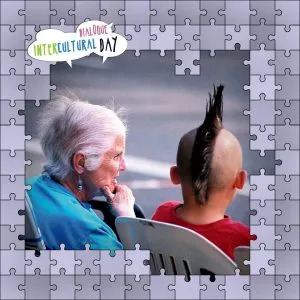 In 2014 EFIL, with a team of volunteers and the financial help of the Council of Europe, produced promotional materials for the Intercultural Dialogue Day. These materials can be downloaded here and you can use them to promote you IDD event.